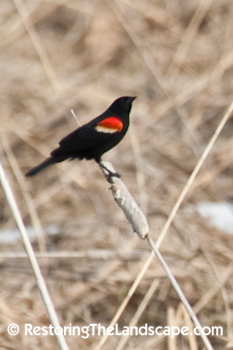 The male Red Winged Blackbirds have returned to Minnesota this week. Much earlier than the past few years, arriving on March 11th in our neighborhood. Our record-breaking warm winter and mild March temperatures have completely melted all snow. Smaller creeks and ponds are starting to open up. The males migrate north before the females returning to establish their breeding territory in the wetlands. 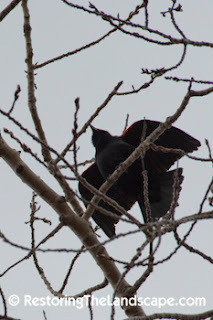 Already calling, they have been sitting up in the trees on the edges of wetlands surveying their domains. As they call they spread their wings flashing their bright red and yellow wing bars and fan their tails. 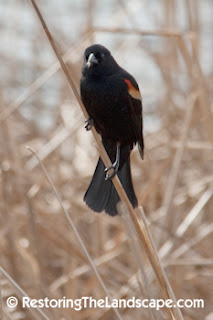 The males will come to our feeders seeking seeds as food prior to the mating season. Once more insects emerge, their diet will change to all insects as the young hatch. Males will mate with more than one female in their established territory. Females will return in a few weeks, possibly at the end of March this year but more typically into early April. 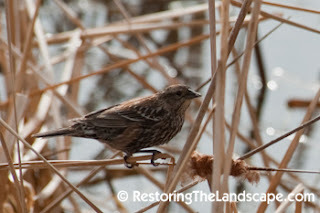 Their mottled brown plumage camouflages them nicely in the previous year's brown cattail stems as they build their nests.